The ecologists and environmental scientists at MAD Scientist Associates are 40-hour OSHA Health & Safety trained and have experience with investigations at RCRA (Resource Conservation and Recovery Act) and CERCLA (i.e., Superfund) sites. 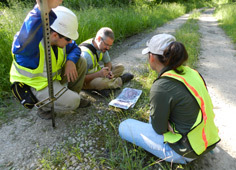 Our environmental consulting team begins the ecological risk assessment (ERA) process with a literature review and ecological reconnaissance site visit to characterize the environmental setting, identify exposure routes (from contaminant sources to ecological receptors), and looks for potential evidence of stress within exposed plant and animal communities. Through this process, we strive to generate sufficient data to provide a “reality check” to balance the inherently conservative assumptions of the standard risk assessment process. All steps in the iterative process of ERA (scoping level, screening level, baseline, detailed) follow the pertinent agency guidance and related literature. The company’s Senior Ecological Risk Assessor is a Certified Ecologist with professional experience in ecological risk assessment.